I can’t claim to be the most disciplined or organized person, but I’m working on both. I have, however, done a lot to smooth out my moment-to-moment work process, to help me do things more quickly & easily, and to help me avoid distractions where I can. I can only hope that I win more time using this stuff than I spent setting it up. 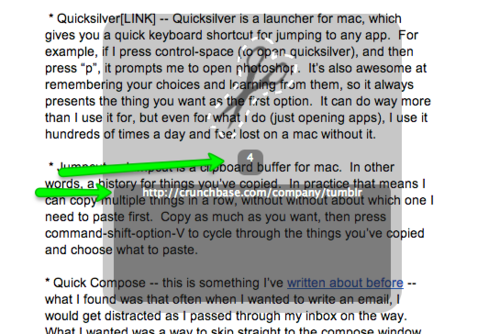 1) Quicksilver — Quicksilver is a launcher for mac, which gives you a quick keyboard shortcut for jumping to any app. For example, if I press control-space (to open quicksilver), and then press “p”, it prompts me to open photoshop. It’s also awesome at remembering your choices and learning from them, so it always presents the thing you want as the first option. It can do way more than I use it for, but even for what I do (just opening apps), I use it hundreds of times a day and feel lost on a mac without it. 3) Quick Compose — this is something I’ve written about before — what I found was that often when I wanted to write an email, I would get distracted as I passed through my inbox on the way. What I wanted was a way to skip straight to the compose window. Luckily, this is possible using Quicksilver — I have a “Custom Trigger” set up, so that wherever I am, Command-Shift-M will pop open a new browser window with the gmail compose screen on it. I use this all day long. Bonus!) 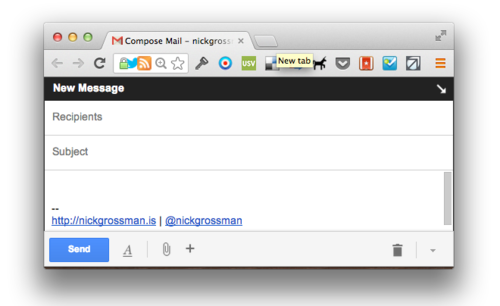 Bookmarklets and Chrome extensions. Everyone who works with me knows I love these. So much. I use them for everything, and have even recently learned how to make my own. My favorites are: post to tumblr, post to delicious, add to pocket, add to feedly, send with gmail (maybe my all-time favorite), and many many more (even a few top-secret ones). As I look through these, the obvious theme is “shortcuts”. Keyboard, chrome button, etc. I guess really like things that let me go straight to the thing I want to do. And maybe it drives me nuts when I can’t. I like the fact that the computers I use are hackable / open enough to make this stuff possible, though of course, that is changing.